The UK government’s white paper on the “value of nature” has been published (pdf here). Biodiversity offsets are mentioned as a good idea to be tested on a voluntary basis by local governments and developers. For the time being, there is thus no expansion of the mitigation hierarchy (of avoiding, reducing and offsetting impacts) beyond that required under the EU “birds” and “habitats” directives. As well as testing offsets, the white paper also mentions the designation of nature improvement areas to be restored. This must be set against the goals mentioned in the recent European biodiversity strategy (also discussed here). The government also plans to set up an (ecological network. The UK national ecosystem assessment is out! The UK National Ecosystem Assessment was finalized and is being published on-line. Started mid 2009, the assessment led by Robert Watson and Steve Albon, it is the first analysis of the UK’s natural environment in terms of the benefits it provides to society and continuing economic prosperity. The key findings of the assessment were made available on June 2nd (pdf here) while specific technical chapters will be made available through June. The authors mention the need to increase food production while at the same time decreasing its negative effects on ecosystem services. In fact, the idea is to harness ecosystem services to actually increase production. This “sustainable intensification” is what the French call “ecological intensification”. Reversing declines in ecosystem services will require the adoption of more resilient ways of managing ecosystems, and a better balance between production and other ecosystem services – one of the major challenges is to increase food production, but with a smaller environmental footprint through sustainable intensification. Not surprisingly, the assessment also raises the issue of ecosystem services being undervalued in decision making and the suggested solution is to take into account the monetary and non monetary values of ecosystems in every-day decision making. Contemporary economic and participatory techniques allow us to take into account the monetary and non-monetary values of a wide range of ecosystem services. 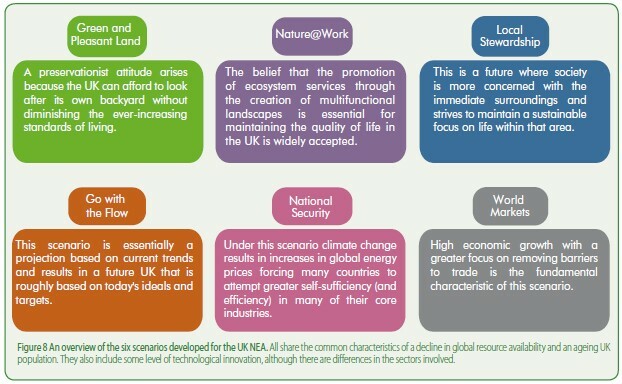 The assessment use six contrasting scenarios to explore alternative futures for ecosystem services in the UK. It is also worth noticing that the assessment’s conceptual framework seems to focus on the “goods” that depend (at least in part) on ecosystem services as the linkage between ecosystems and human well-being. A more in-depth look into the figure below shows that in fact, the authors have grouped under the label “goods” all use and non-use, material and non-material benefits from ecosystems that have value for people. I had mentioned in a previous post how the UK was discussing policies for biodiversity offsets and habitat banking. Conclusions from the Natural Capital Initiative‘s third workshop, which took place in early December 2010, are not yet on-line but they are discussed by Daniel Kandy of the ecosystem market place on their website. Given the coalition government’s commitment to reducing regulation and meting out more power to local governments, a biodiversity offset program will more than likely be voluntary in nature and be regulated at the local level. After years of a Labour government opting for top-down regulatory approaches, the Conservative-Liberal Democrat coalition government has decided to move towards a less centralized form of government oversight. The most interesting offer of the toolkit is the interactive landscape which lets the user navigate the different issues listed above in an attractive setting which is pretty much self-explanatory. The interactive landscape is very useful as a first introduction to the British planning regime and environmental regulations as well as all the key components of biodiversity, ecosystems and landscapes that are under consideration. This blog presents detailed analyses and short comments on current events and trends in the science, management and policies of biodiversity and ecosystem services. Special emphasis is given to the policy-mix aimed at achieving no net loss of biodiversity (including biodiversity offsets, conservation banking) and the underlying theory and practice of ecological assessments (including ecological equivalency methods). Focus on the process! That’s what restoring ecosystems means, and needs. Sharing nature’s bounty or managing the services provided by natural capital? Biodiversity offsets: the most promising nature-based opportunity for UK businesses?! The IBPES is established – Is it all good news?